At first glance, it might look like just a word search puzzle but look deeper to know it is much more! 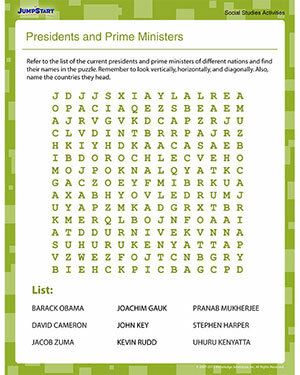 JumpStart's 'Presidents and Prime Ministers' is a printable social studies activity for kids that involves a word search puzzle containing the names of the presidents and prime ministers of 9 countries. Not only will kids exercise their critical thinking skills by solving this puzzle, they will also figure out which countries these 9 men head.